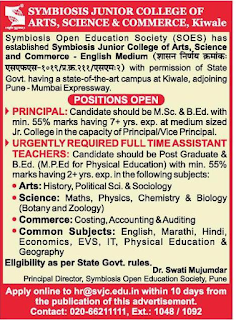 Symbiosis College Pune Notification 2019 Principal / Assistant Teachers Jobs Apply Online,Jobs in Symbiosis College Recruitment 2019 for Principal / Assistant Teachers ,Principal / Assistant Teachers Jobs in Symbiosis College. from the notification date. They required Minimum 7+Years teaching Experience for Symbiosis College Principal Job and 2+ teaching Experience for Symbiosis Junior College Assistant Teachers Posts. For more details refer the official website symbiosiscollege.edu.in for Principal / Assistant Teachers Jobs recruitment 2019. More details Like Selection Process, Important Dates, Qualification, Salary and e.t.c. Are available given below. Symbiosis College of Arts Science & Commerce (Symbiosis). 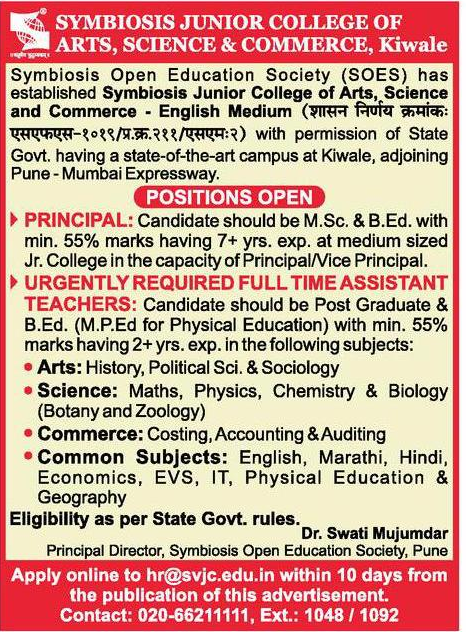 Starting Date to apply for Symbiosis College Principal / Assistant Teachers Jobs: 19-03-2019. Ending Date to apply for Symbiosis College Principal / Assistant Teachers Jobs: Update will be soon. Principal And Assistant Teachers Posts.